Mount Carmel is the biblical site where the prophet Elias battled the 450 priests of Baal in a public spiritual contest which led to their defeat and ruin as Scriptures aptly recorded. (1 Kings 18:19-40). It was also here where Elias sent his servant seven times to the mountaintop to look for rain after years of drought which ended as he proclaimed, “Behold a little cloud arose out of the sea like a man’s foot.” (1 Kings 18:44). We can find Mount Carmel on the Mediterranean coast of Israel, overlooking the modern-day city of Haifa. It rises 1742 feet above sea level and towers above the Mediterranean coastline and its limestone rocks form a cliff-like landscape. Nowadays it comes in various names as Antelope-Nose, Har Karmel, Holy Headland, Jebel Kurmul, Mar Elyas, Mount of User, Rosh-Kedesh. mountain at the time of the Old Testament. There, this pious and austere community prayed in expectation of the advent of a Virgin-Mother who would bring salvation to mankind much like the holy prophet Elias who ascended Mount Carmel to pray to God for the salvation of Israel which was suffering a terrible drought at that time. Elias “went up to the top of Mt. Carmel, and casting himself down upon the earth put his face between his knees.” (1 Kings 18:42). Soon thereafter, torrential rains fell upon the parched land and the people of Israel were saved. Elias saw the cloud as a symbol of the Virgin mentioned in the prophecies of Isaiah (Isaiah 7:14). The hermits took after his example and prayed likewise for the advent of the much awaited Virgin who would become the mother of the Messiah. It became their spiritual mission. Theologians see in that little cloud a figure of Mary, bringing salvation in the seventh age of the world. As the clouds arise out of the sea without the weight and the salinity of the waters, so has Mary arisen out of the human race without suffering its stains. 1. The Immaculate Conception – because the Virgin would arise as a cloud out of the salty water of a guilty humanity, having the same nature of that water but without its bitterness. 2. The Virginity of Mary similar to that of Elias – because, if she “arose out of Mount Carmel” and “like a man’s foot,” this means she would follow the path of Elias, who ascended Carmel through voluntary virginity. 3. The time of the Virgin’s birth – because as Elias’s servant saw the cloud on his seventh try so would the world witness the advent of the Virgin in the seventh age of the world. 4. The Virginal Maternity – because, in that little cloud, God would come down like sweet rain, “without noise of human collaboration,” that is, without violating her purity. Elias led a hermetic life on Mt. Carmel with special veneration for the Most Holy Virgin. His disciple Eliseus, whoreceived his mantle, and other followers, known as Sons of the Prophet as Holy Scriptures described them, participated in his solitude and became filled with his strength and spirit. In a holy hereditary succession, they passed on his spirit and strength to others. Through the continuous propagation of the above practice, the foundation and development of the Carmelite order began to take root. This we learn from tradition, liturgy, works of various authors and several bulls addressed to the Carmelite Order by Popes John XXII, Sixtus IV, Julius II, St. Pius V, Gregory XIII, Sixtus V and Clement VIII. One beautiful passage from a private revelation to a mystic relates that after the High Priest of Jerusalem had announced that St. Joseph was to be the spouse of Our Lady selected by God Himself, “the young man from Bethlehem joined the hermits of Elias on Mount Carmel and continued to pray fervently for the Messias. According to a long held and pious tradition, backed by Church Liturgy, a group of men devoted to the prophets Elias and Eliseus embraced Christianity on the day of Pentecost. They had been the disciples of St. John the Baptist, who prepared them for the coming of the Redeemer. However, in 1668 a Belgian Bollandist and Jesuit hagiographer, Daniel Van Papenbroek, dismissed the above story as fable or legend for lack of concrete evidence in the March volumes of the Acta Sanctorum. A bitter controversy arose that dragged on for years, eventually reaching Rome in 1698. Innocent XII issued a decree imposing silence over all concerned parties until a definitive pronouncement could be reached – which was never formally realized to date. Be that as it may, in spite of the cloud of mystery and controversy surrounding these beginnings, the Carmelite Order has always claimed Elias as its own and has seen him as the one who laid the foundations of the eremitic and prophetic life that formed part of its character. It would take several centuries before historical and documental proof could be gathered as to the existence of hermits on Mount Carmel with spiritual links to the prophet Elias. The first concrete text dates back to 1177 through the writings of the Greek monk John Phocas. The monastic-style spirituality was practiced and observed on Mt. 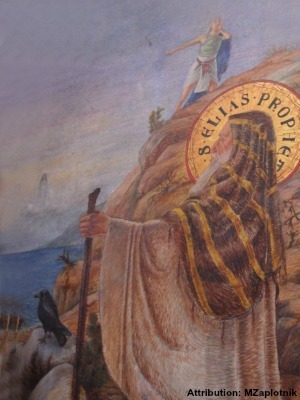 Carmel through the pioneer efforts of St. Berthold of Mount Carmel, who may have come to the Holy Land from Limoges, France as a pilgrim to visit Elias’ cave, or as crusader who engaged in battle. He gathered other hermits from the West who were scattered throughout Palestine at that time to form a community imbued with the spirit of Elias. St Berthold organized them as cenobites, a monastic tradition that stresses community life under a religious rule. St. Brocard championed the cause to have the monastic spirit which they had received from their predecessors be enshrined in a holy Rule. Around 1210, it was given to the Order by St Albert, the Latin patriarch of Jerusalem, and later finally approved and authorized by Pope Innocent IV in 1247. The primitive Carmelite rule initially contained sixteen articles and later underwent some modifications. 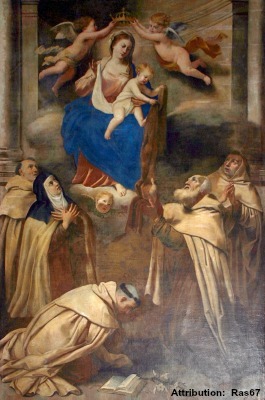 Any account of the story of Our Lady of Mount Carmel could not fail to mention the role that St. Simon Stock played especially in relation to the brown scapular. We could trace Simon Stock’s origin to the County of Kent in England where he was born around 1165. Being of English descent, he was also known as Simon Anglus. In the thirteenth century, during the era of the Crusades, he joined a group of hermits on Mount Carmel who claimed to be the successors of Elias while on pilgrimage to the Holy Land. As the situation became too precarious for them due to Saracen threats, the community moved and settled in Aylesford, England. In 1247, at 82 years old, Simon was elected the sixth Superior-General of the Carmelites at the first chapter held there. He instituted reforms to best suit Western conditions and the cenobitical rather than the eremitical way of life. As such, the community came to be regarded eventually as a mendicant order along with the Dominicans and the Franciscans. However, the order had difficulty gaining general acceptance and suffered much persecution and oppression from secular clergy and other orders which prompted the monks to have recourse to the Blessed Virgin in the year 1251. Tradition says that Our Lady responded to their call through an apparition to Simon Stock on Sunday July 16th, 1251 as he knelt in prayer. She appeared holding the Child Jesus in one arm and the brown scapular in the other hand while uttering the following words: “Hoc erit tibi et cunctis Carmelitis privilegium, in hoc habitu moriens salvabitur” (This shall be the privilege for you and for all the Carmelites, that anyone dying in this habit shall be saved.) On 13 January 1252 the Order received a letter of protection from Pope Innocent IV, defending them from harassment. The scapular of Our Lady of Mt. Carmel, also known as the Brown scapular, is one of the most popular and celebrated of Roman Catholic devotions. The sacramental as the lay faithful commonly use it, is a miniature derivative of the actual brown scapular used by the Carmelites – the sleeveless outer garment falling from the shoulders which is worn as a sign of their vocation and devotion. Attached to the wearing of the Brown Scapular is the Sabbatine Privilege. The name Sabbatine Privilege originates from the apocryphal Bull “Sacratissimo uti culmine” of John XXII, 3 March, 1322. 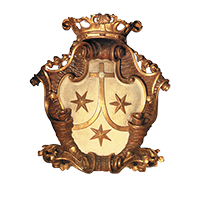 The papal document declares that the Mother of God appeared to him, and most urgently recommended to him the Carmelite Order and its confratres and consorores. 3. And pray the Rosary. The feast of Our Lady of Mount Carmel was instituted by the Carmelites between 1376 and 1386 under the title “Commemoratio B. Marif Virg. duplex” to celebrate the victory of their order over its enemies on obtaining the approbation of its name and constitution from Honorius III on 30 Jan., 1226 (see Colvenerius, “Kal. Mar.”, 30 Jan. “Summa Aurea”, III, 737). The feast was assigned to 16 July, because on that date in 1251, according to Carmelite traditions, the scapular was given by the Blessed Virgin to St. Simon Stock; it was first approved by Sixtus V in 1587. 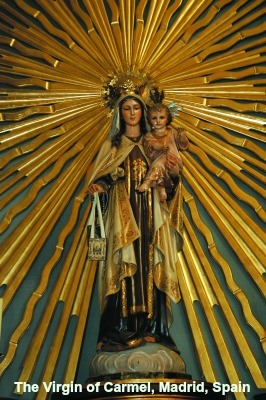 Thus through the centuries Our Lady of Mount Carmel kept a constant watch over her children, ever solicitous to intercede for them and lead them to Her Divine Son. Amidst the sea of chaos, confusion and impiety raging in the world today, may Our Lady of Mount Carmel grant us strength and fortitude so we may all remain faithful to Her Son and His Holy Church. Feast of Our Lady of Mount Carmel, Preface and Epistle. De la Croix, Paul Marie, O.C.D., “Carmelite Spirituality,” http://carmelitesofeldridge.org/spirit.html, last visited: June 9, 2010.